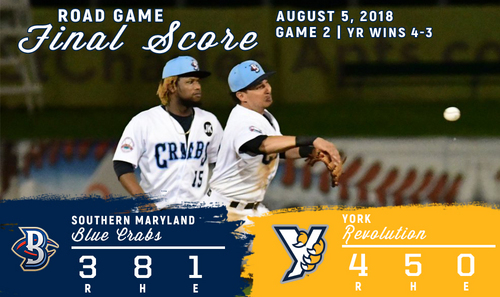 (York, PA.., Aug. 5, 2018) - The Southern Maryland Blue Crabs (9-15) dropped the series finale against the York Revolution (12-13) 4-3, taking two out of three games in the series. York wasted no time grabbing the lead in the finale, scoring three runs in the bottom of the first. Back-to-back doubled from Travis Witherspoon and Melky Mesa opened the scoring, with a hit-by-pitch putting Telvin Nash aboard as well. Two batters later another hit-by-pitch loaded the bases with two outs for Henry Castillo. Castillo promptly doubled to score Mesa and Jared Mitchell, giving the Revs an early 3-0 lead over Casey Delgado. Rob Carson started very strong on the mound for York, allowing just one hit through the first three innings against his former team. However, Southern Maryland got their offense going in the fourth starting with back-to-back singles from Francisco Rosario and Edwin Garcia. After a flyout moved Rosario to third, he came across on a single from Jon Griffin. Angelys Nina would single to plate Garcia, cutting the deficit down to just one run. Both teams stranded runners in scoring position in the fifth inning, sending the 3-2 game into the sixth. The Blue Crabs mounted a major threat in the inning, leading to Carson’s exit from the game. After a strikeout started the inning, singles from Garcia and Frank Martinez forced York to turn to reliever Jailen Peguero. The right-hander forced a flyout from Griffin that allowed Garcia to reach third, before he walked Nina to load the bases. Peguero recovered to get a flyball to center field, escaping the inning with the lead intact. The Revs then turned to their closer Grant Sides (4-0) in the top of the seventh, looking to close the game and series. Sides walked Vaughn to start the inning, with a sacrifice bunt from Kalaika Kahoohalahala moving the runner to second. Back-to-back walks ensued to load the bases once again, this time with one out. Garcia came through with a sacrifice fly to score Vaughn, tying things up at 3-3 before Sides could get out of the inning. Welington Dotel walked to start the bottom half of the inning, moving around to third on a single from Alonzo Harris. A walk to Witherspoon loaded the bases for Mesa, with still nobody out in the inning. Mesa singled to left field, bringing home Dotel as the winning run and giving York the 4-3 walk-off win. The Blue Crabs return to action Tuesday, August 7th for the series opener against the Sugar Land Skeeters. First pitch is scheduled for 6:35 P.M. on Tuesday at Regency Furniture Stadium.